I started this post 3 weeks ago! And now, we have been home just over 6 weeks with our kids. If you count the 10 days we were with them in country, we have now been a family of 4 for seven weeks! I am doing a little catch up blogging as I have a chance. It is Saturday morning. Martin is still sleeping but Emi is awake! Andrew and I flew out Saturday, May 16 from the USA to Bulgaria! Thanks to Andrew's parents for dropping us off at the airport! We flew to Toronto, had a short layover, then had our long, overnight flight to Frankfurt, Germany. Our emotions were lots of excitement to see the kids after 7 months of being apart, along with some nervousness about parenting. Thank you to Andrew's brother Dan for the cards he wrote to both of us about becoming parents! We enjoyed reading them on the plan! We had a 5 hour 5 minute layover in Frankfurt. I had researched ahead of time and was armed with a plan to leave the airport and see a little of Germany. We didn't know if we would ever have a chance to be in Getrmany again. This was our last chance for a great adventure before children were added to our family. We took the subway three stops from the airport to the central station in Frankfurt. Outside Central Station in Frankfurt, Germany. We walked along the Main River in a beautiful park to the old town square in Frankfurt. The weather was perfect. We walked through the old town square which had typical old German architecture and a statue & fountain of the goddess Justitia, representing justice. Many of them were destroyed in WWII and have been rebuild according to original plans/blueprints. Huge clock we walked under on our way to the church. Our goal in all this walking was to go to St. Bartholomaus Cathedral. When we arrived, a service had recently ended and the church was open. We entered and sat on the back pew and spent a few minutes praying for our growing family. This beautiful cathedral survived WWII bombings. Our view from inside on the back pew. We then walked back to the subway station and rode three stops back to the airport. We made it through security in plenty of time, found our gate, and had time for a nap. Our next flight was from Germany to Bulgaria. When we arrived, our translator, Ivan was waiting for us with a smile and a hug and Dimo our driver was waiting at the car. We rode to our apartment, got settled in a little bit to our apartment, and went to bed. Praying with time, the adjustment home has become easier!! Miss your blog! Help us bring our children home! 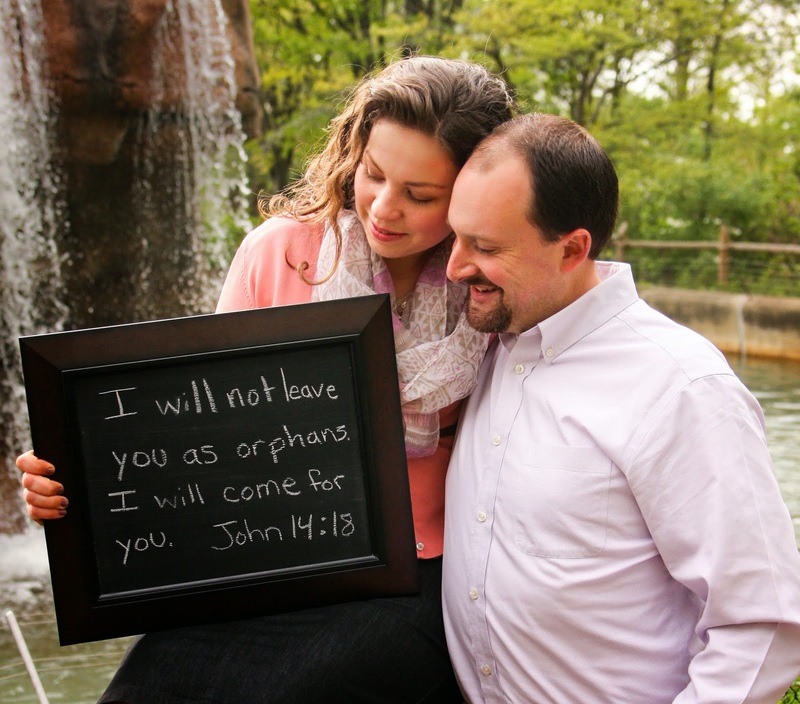 If we can raise $3,000, Life Song for Orphans will match the donations with a $3,000 adoption grant. Every dollar you give will be matched up to $3,000! When you buy on Amazon you can help us adopt! Just use this link: www.tinyurl.com/helpandrewandkatieadopt. If you use Amazon often please book mark our link! Happy 1st July 4th to 2 New American Citizens!